This paper is a shortened version in English language of the original paper published in German in the dgg journal of the Deutsche Glastechnische Gesellschaft 10, 2011, 57-63 (mentioned on page Archaeochem. Publikationen des Autors, no. 23). Until now none of the usual journals for archaeology and archaeometry was willing to publish this paper. The given reasons for the rejection were rather curious: too speculative, missing knowledge of reviewers in the field of glass, unawareness of the uniqueness of the find and of the hypothetical character of the paper, and other flimsy and contrived reasons – a very unappetizing mixture. Apparently the new ideas did not fit in with the imagination of the reviewers and the editors. My intention was to publish a new hypothesis. I met many archaeologists, especially younger ones, who thought the subject to be interesting and worth to be reconsidered. A successful lecture was given. Please get your own idea of that old find and my working on it. R. T. Guenther (1911/1912) published a study of a small glass mosaic which he had excavated in the ruins of an Imperial Roman villa situated on the Posilipo peninsula near Naples. 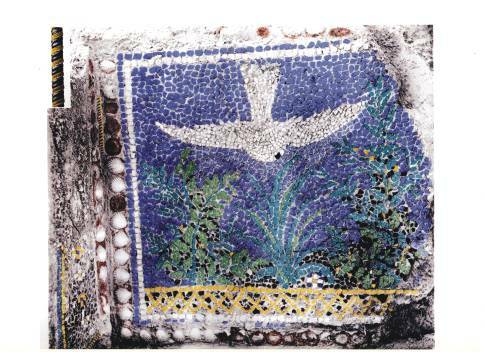 The subject shown in the mosaic is Roman: a white dove flying towards the observer against a blue sky over green plants (Fig. 1). Similar pictures – frescoes or glass mosaics – have been excavated in Pompeii. The dove mosaic, dating from the imperial time, was left in situ; only some samples were taken. The strange pale green color of some tesserae in this mosaic led to an analytical investigation using the limited analytical methods available at the beginning of the last century. Presumably they were performed by gravimetry. The quite astonishing results are shown in figure 2. So far the only available archaeological and archaeometric information. No results of further excavations in the ruins of the villa have been published. The archaeochemical paper given in the following could be based only on an analytical investigation performed in the beginning of the 20th century. The uranium content found is unique. It seemed to be so unlikely that Freestone (1998) called the uranium issue a red herring and the object a fake. But he adds that “… it could be argued that somewhere there may be a handful of glasses colored by uranium, but this would be completely at variance with the remarkable degree of standardization shown by Roman glass in all other respects”. All this is true, and the author could agree – if the object in question were Roman. However, we posit three reasons for pursuing another line of thought. Firstly we have another independent analysis result published in 1963 which confirms the old determination of uranium. A radiometric analysis performed by Prof. Kirchheimer (1963a, 1963b), using a sample he had received from the Ashmolean Museum, Oxford, confirmed the uranium content in the same order of magnitude as reported in Guenther’s publication. Prof. Dr. Franz Kirchheimer Sen. (1911-1984) was President of the Geologisches Landesamt Baden-Württemberg in Freiburg/Br., Germany, and a uranium expert. He performed the analyses in the laboratories of his department in Freiburg and the Bundesanstalt für Bodenforschung, Hannover, Germany. Incidentally no Roman glass objects containing significant amounts of uranium (i. e., more than traces in the ppm-level) have been published. Secondly no attention was paid until now to another strange analytical result given in figure 2: the potassium content. All the Roman glass we know is based on sodium. No chemist would confuse sodium and potassium; the respective gravimetric determination methods are quite different. According to opinio communis, there is no Roman glass based on potassium as the alkali component, not even one such object! The third surprising fact is the low calcium oxide/potassium oxide (CaO/K2O) ratio which amounts to 0.44. Guenther (1911/1912) further states that the composition of the blue tesserae is the same as that of the pale green ones with the exception of the presence of cobalt instead of uranium. Unfortunately no further analyses of the object are possible: the mosaic disappeared, probably during or after World War II. The samples are lost; no residual particles remain. So no analyses using modern methods of analytical chemistry can be performed. Equally, no documentation or analysis reports which might have existed can be found. So we have to try to understand the old results in another light. The three evident facts mentioned above – no Roman uranium containing glass, no Roman potassium glass, the low CaO/K2O ratio – led the author to a new approach: the glass of the mosaic is not of Roman origin. We must search for the production centre on the other side of the early Roman Imperium and away from Roman trading routes for Roman raw sodium glass. There are two reasons for suggesting the location of this production centre in the south of England at the beginning of the first millennium: uranium ores are found near the surface of the earth in Cornwall. They stand out because of their striking colours. The low CaO/K2O ratio in the glass is, according to Wedepohl (2003), typical of fern ash as an alkali source. The CaO/K2O ratio of wood ash glasses lies in the range of 0.8 to 3 or even higher. Fern (probably bracken) ash was used in France and England still in the Middle Ages instead of wood ash when wood was unavailable. Up until now, only some analysis results of antique potassium or potassium/sodium glasses have been published: Henderson (1988) of glass found in Ireland (9th to 8th century B. C.) and the Gironde area (1st century B. C. to 2nd century A. D.), Kurzmann (2000) of glass found in the Celtic settlement near the Heuneburg (6th century B. C.). All these glasses are non-Roman, of course. The original glass is based on a mixture of two substances: sand and fern ash. They both can contain Ca, Fe and Al. The CaO and Fe2O3+Al2O3 values determined analytically are – of course, somewhat speculatively – therefore shared out between these two components. Tables 2a and 2b demonstrate this step. The oxides K2O, CaO and MgO are added to the mixture not directly but in form of the carbonates. The values must be converted, therefore, into carbonate contents by means of the respective stoichiometric factors. Tables 3a and 3b show this calculation. The mixture contains 67.47 g of sand and 66.06 g of fern ash (or equal multiples of both components). The percentages amount to 50.5 % of sand and 49.5 % of fern ash. The somewhat speculative sharing out of contents in CaO und Fe2O3+Al2O3 mentioned above has been fixed without knowing this result. Calculations performed later show that variations lead to only slight deviations and, as a practical matter, do not affect the ratio 1:1. In summary, one can say that the glass-maker used a 1:1 (weight) mixture of sand and fern ash for the basic glass and added a little amount of uranium ore (or in case of the blue tesserae of a cobalt ore). Consequently further work on searching for glass of the type used in the dove mosaic might well be carried out in Celtic or adjoining territories. The objective of this work must be to find more glasses of relevant composition and their local classification. The question how these tesserae came to Italy in antiquity remains unanswered. Fünfschilling (2011) had the idea that they may have been produced in Italy using broken bracelets imported by trade or as a gift. When evaluating analysis results of glasses one should realize that the detection of potassium does not necessarily prove that the glass in question had been produced in the Middle Ages. The outlined method based on analysis results for the evaluation of glass formulas is applicable also in other cases and can help to understand the formulation work of the glass-makers and their production processes. The author is grateful to Dr. W. Stewart for having polished up the English text. In 1912 R. T. Guenther published the study of a small glass mosaic dating, perhaps, from the Augustan period, which he had excavated in the ruins of an Imperial Roman villa situated near Naples. The strange pale green color of some tesserae in this mosaic led to an analytical investigation with very astonishing results: uranium and potassium were identified. These results unique for Roman glass led the author of the paper presented here to a new interpretation: the glass is not Roman, but may go back to people living in the border territories of the Roman Empire, e. g. Celts or other people perhaps influenced by the Celtic culture. The low CaO/K2O ratio indicates the use of fern ash, and the deposit of uranium ore near the surface of the earth in Cornwall lead to the idea that the glass comes from South England. Further work on searching for glass of the potassium or mixed alkali type should be carried out in the Celtic or adjoining areas. The question how the tesserae came to Italy in antiquity remains unanswered. Naples, Early Roman Empire, Uranium Glass, Potassium Glass, Fern Ash Glass, Mosaic Tesserae. Freestone, I., (1998), Romans & uranium glass – a red herring question?, Nuclear Europe Worldscan 18, p. 45. Fünfschilling, S., 2011, kind e-mail dated 21. 9. 2011. Guenther, R. T., 1911/1912, A Murial Glass Mosaic from the Imperial Roman Villa near Naples, with a Note on the Analysis of the Green and Blue Glass by J. J. Manley, Archaeologia or Miscellaneous Tracts Relating to Antiquity 63, pp. 99-108. Henderson, J., 1988, Electron Probe Microanalysis of Mixed-Alkali Glasses, Archaeometry 30, 77-91. Kirchheimer, F., 1963a, Urangläser in alter Zeit, Glastechnische Berichte 36, 488-490. Kirchheimer, F., 1963b, Das Uran und seine Geschichte, pp. 275-276, Stuttgart: Schweizerbart. Kurzmann, P., 2000, Untersuchung von Glasfunden aus der Heuneburg-Aussensiedlung, in: Kurz, S., Die Heuneburg-Aussensiedlung, pp. 187-188, Stuttgart: Theiss. Wedepohl, K. H., 2003, Glas in Antike und Mittelalter, p.184, Stuttgart: Schweizerbart.